Frequently used fundamental trigonometric identities or tools to enable simplification of trig expressions are encompassed here. 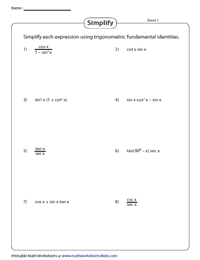 Prep up with a thorough knowledge of the identities from the fundamental trigonometric identities chart. The high-school students can get an in-depth knowledge of identities like quotient, reciprocal, cofunction and Pythagorean. Learn to simplify, prove and evaluate expressions too. Use quotient identities to find the value of trig functions. Express tan and cot in terms of sin and cos to solve the problems. Determine the value of a trigonometric function using reciprocal trigonometric identities. In simpler terms, to solve the problems just flip the corresponding trig functions. 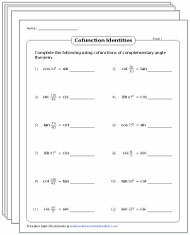 Recapitulate the concept with these worksheets consisting of ample exercises to find the value of trigonometry functions using a combination of quotient and reciprocal identities. 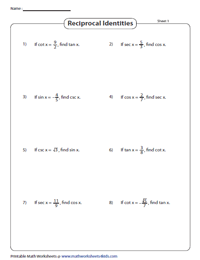 Access the set of worksheets here that focus on solving and evaluating expressions using cofunction identities or the complementary angle theorem. 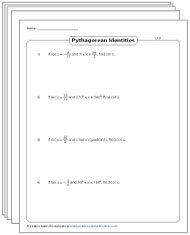 Incorporate these worksheets to simplify and verify trigonometric expressions using the three basic Pythagorean identities in combination with the other identities. 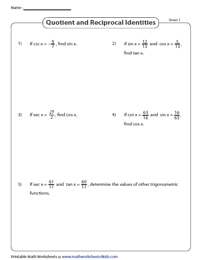 Precisely dealing with exercises to simplify expressions using the fundamental trigonometric identities, the worksheets here provide ample practice in simplification. 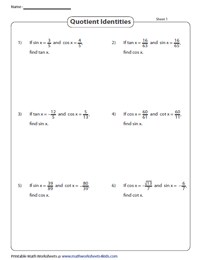 Verify and prove the expressions on either side are identical by simplifying using the fundamental trig identities in this worksheet stack. Recapitulate the fundamental identities in the process. 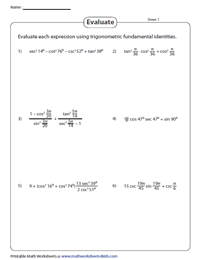 Implement these worksheets encompassing skills to evaluate trigonometric expressions consisting of angle measures in either a degree or a radian without using a calculator. A sound knowledge of the fundamental identities is a must.